Cropped catalog page featuring tiny box art for the cancelled Microvision game Barrage. Some European countries, such as Germany, the United Kingdom, and France also received eight Microvision games. 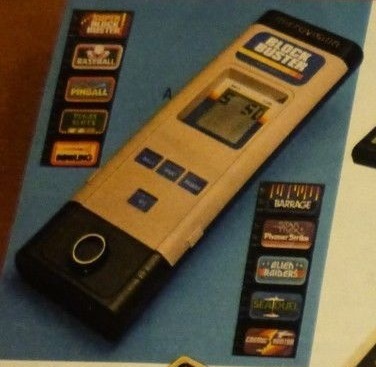 Seven games: Block Buster, Bowling, Phaser Strike, Pinball, Connect Four, Sea Duel, and Alien Raiders were given different cartridge bodies, different packaging, and different names, but the games themselves were identical to the U.S. releases. The eighth European game, Super Blockbuster, was the only European exclusive. Boxart and a catalogue listing for a U.S. release of Super Blockbuster do exist, but it was never released. Even if it had been released, it can be safely assumed that it would have been identical to the European release. All twelve of the officially released games are found, and their data has been dumped online for use in emulation. However, there is evidence of a thirteenth game in production. 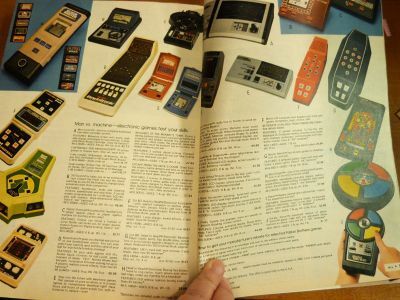 The Montgomery Ward Christmas catalog for 1982 contains a catalog listing for the Microvision and ten games. Barrage is on this list, and both a tiny version of the box art and a catalog number are provided. It should be noted that the box art and catalog number of the cancelled U.S. release of Super Blockbuster are also present. 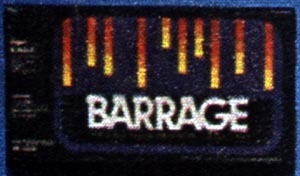 Barrage is stated to cost $15.77, the same as any other Microvision game. The catalog does not contain any gameplay details. The box art of multiple lines dropping down from the sky suggest that this may have been a port of the arcade game Missile Command, but this is unconfirmed. No retail units or prototypes are known to exist. No official explanation from Milton-Bradley is known to exist. Clearer image of the Barrage box art taken from the 1982 Montgomery Ward Christmas catalog. The entire two-page spread from the catalog featuring the pricing details for Barrage.